What’s better than a delicious light and creamy custard treat? 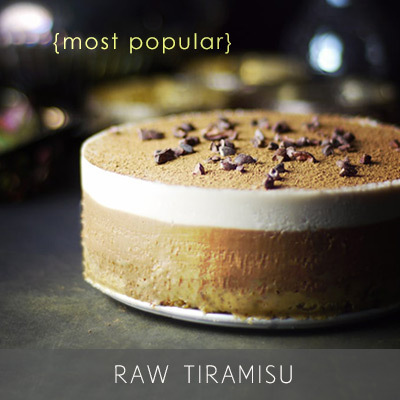 A cinnamon and carob version. Trust me — it’s good. 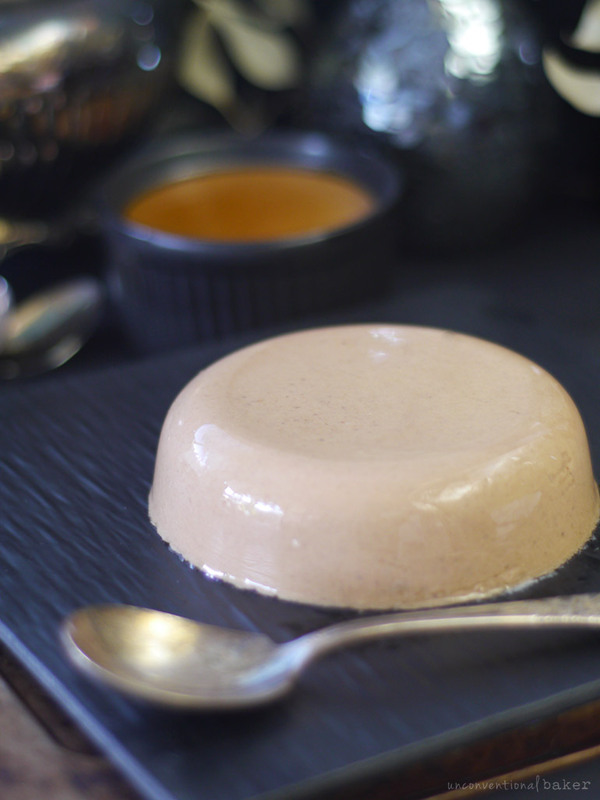 In the week after making this delish vegan flan recipe I just couldn’t stop making it. 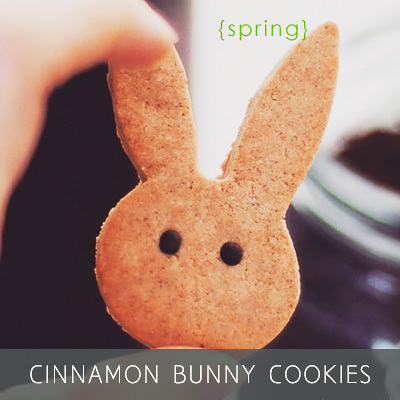 It became my new favorite treat (ok, amidst many favorites… but you know what I mean, I’m sure ?) . I made so many versions that it became a daily thing for a while. I just couldn’t get enough. 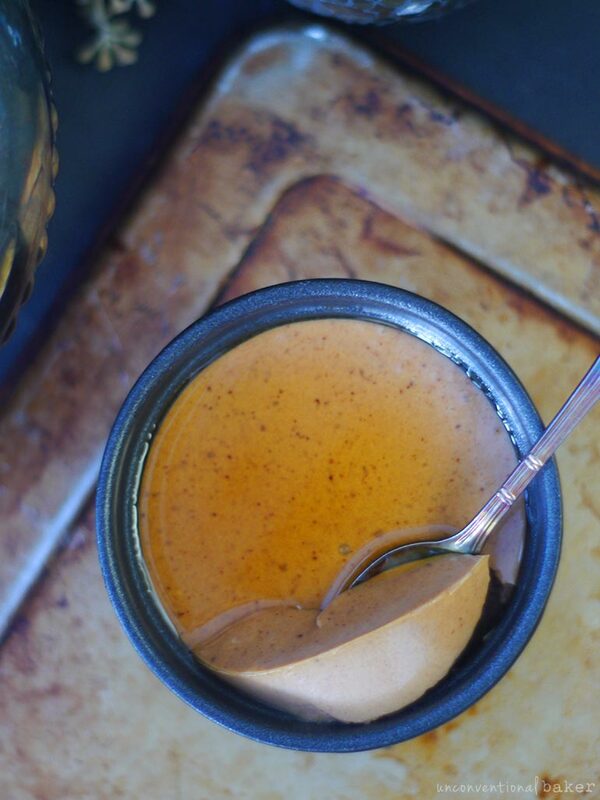 This particular carob cinnamon version was a huge winner, and not just with me but also with all the taste testers I enthusiastically loaded up with miscellaneous containers of flan / custard as soon as they stepped into the kitchen… So I’m giving it the spot it deserves in its own right on the site. 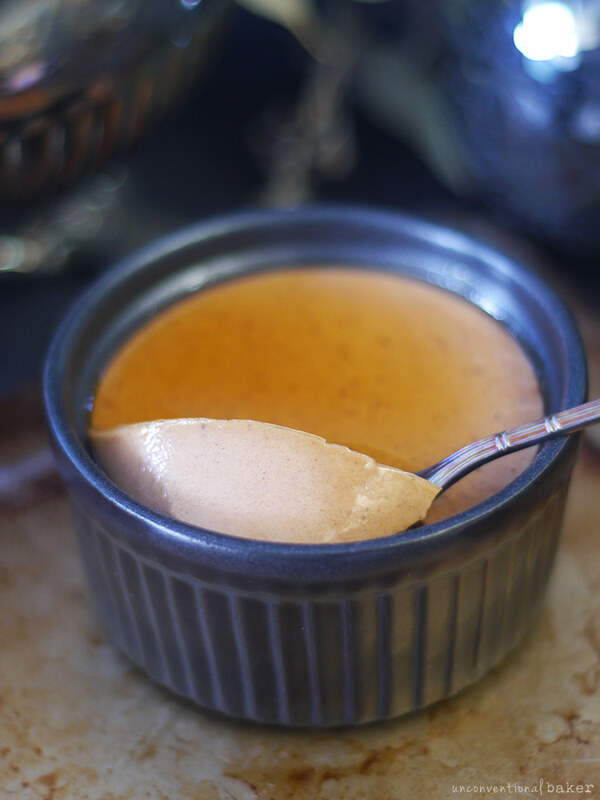 Plus I’m sure some of you are looking for more things to do with agar agar after purchasing some for the flan, so here you go — another treat to whip up with it. 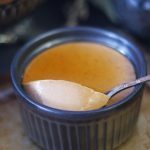 I don’t share recipes with agar agar often (though it is an amazing ingredient that can help you make things like gelatin-free jello or eggless lemon curd) because it tends to be one of those things that causes people unfamiliar with it go “what’s that? !”, “is there something else I can use? !” etc. And I don’t like to create such panic ?. But in this case the agar agar is necessary, and I promise it’ll be absolutely worth going outside your comfort zone for. By the way, I’m calling this treat a custard because I don’t want the flan police to come after me ? ? — it’s already weird enough to take out the eggs, sugar, and milk from the flan, I know ?. Adding cinnamon and carob to it would be pushing it over the edge, I felt. So a custard it is… but we all know what’s going on here… ? And if you wanted it to be more flan-like, you can see from the photo above that it pops out of the ramekin quite nicely as well. So you’ve got options. Although I have to say, my favorite way of eating this treat was drizzling it with maple syrup and tucking in with a spoon straight into the dish ? One other thing I did differently here is use freshly made almond milk instead of coconut milk and it turned out really creamy and delicious. So now there’s an option for the coconut-free folks too :) It turned out just as light, smooth, and satisfying with this almond milk version. P.S. 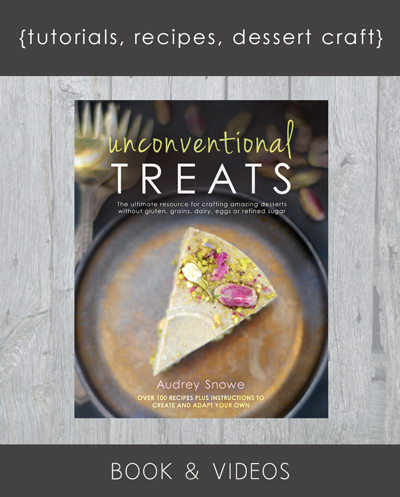 if you wanted to give homemade almond milk a try but weren’t sure how, there’s a chapter dedicated to it and a video tutorial available in Unconventional Treats. 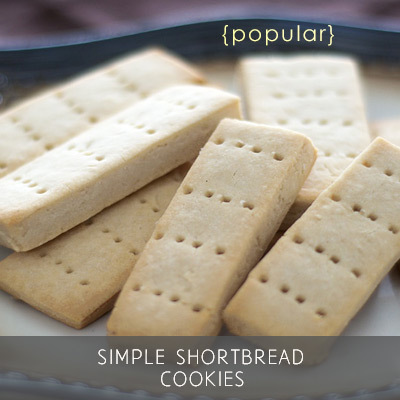 Otherwise you can also always use your favorite unsweetened store-bought version. 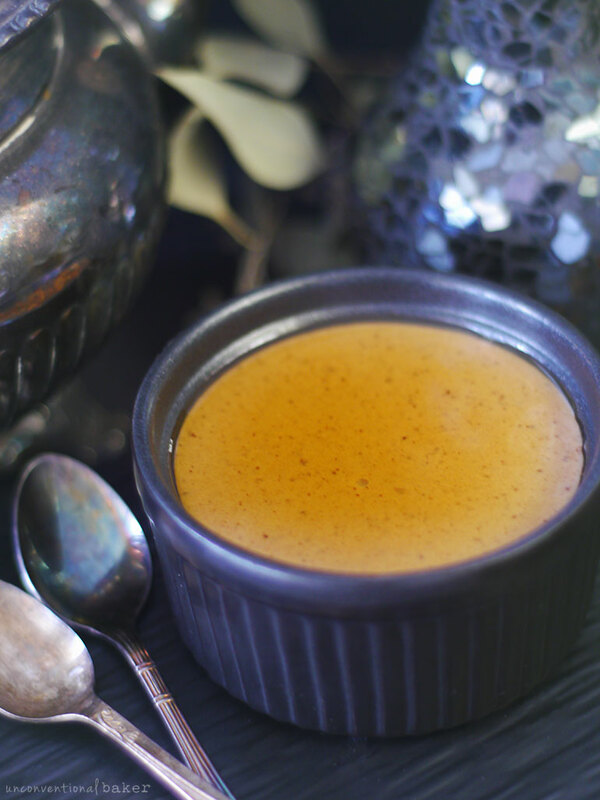 This refined sugar-free eggless custard is a simple, light, smooth, and comforting little treat, with the warm flavors of cinnamon and carob to make it extra cozy. Vegan and free from: gluten and grain, added oils, soy, and coconut. 1. 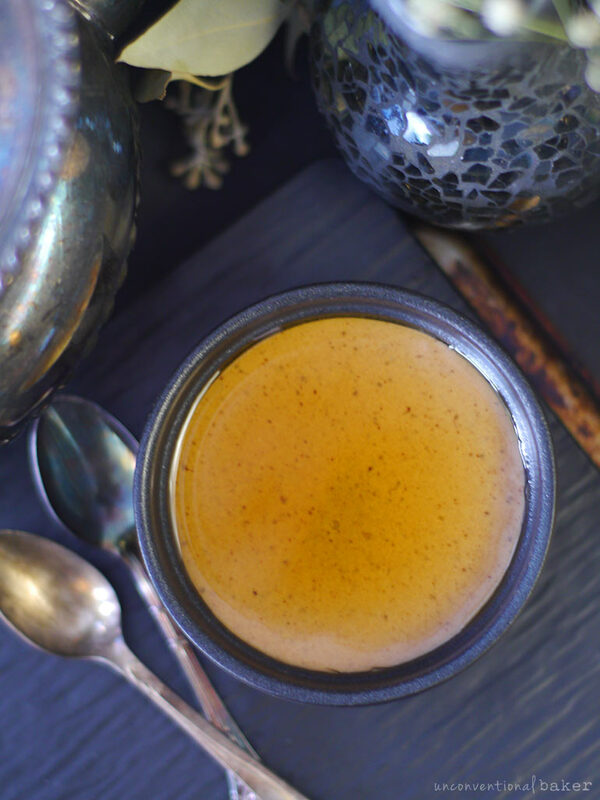 Place the carob powder, cinnamon, and a 3-4 tbsp of the almond milk in a small cup and stir to combine (note: this step prevents the carob and cinnamon from clumping up when added to the bigger pot in step 2). 2. Place all custard ingredients (including the mixture from step 1) into a small sauce pan and bring to a simmer on medium heat, stirring regularly. Once the mixture comes to a light simmer, let it simmer for about 30 seconds to 1 min, then turn off the heat. 3. Divide this mixture between three small ramekins (or small glass containers), let cool to room temperature, then carefully place in the fridge and refrigerate for two-three hours (or overnight) to set. 4. When ready to eat, drizzle with some maple syrup and enjoy. Or alternatively run a knife around the edge of the custard to loosen it up a little, then flip the ramekin onto a plate and tap the top to release the custard. Top with some maple syrup and enjoy! Keep leftovers refrigerated. Note: agar agar flakes are not the same as agar agar powder. They are the same source product, but the change from flakes to powder is significant as the powder is a lot more concentrated. I used flakes here as that is what I had on hand, but if you want to substitute agar agar powder in this recipe you’ll need to reduce the amount to about .66 of a tsp (the conversion of powder to flakes is 1:3). Disclaimer: this post contains affiliate links to the following products used to make it: agar agar flakes, small ramekins. Hi Audrey. Wanting to make this recipe, looks so yummy! I’m looking to make it with what I have on hand, which happens to be everything plus gelatin instead of agar agar (don’t hate the non-vegan in me). Would I just follow usual instructions and proportions for the gelatin to the rest of the ingredients? Or should I just make the extra trip for the agar? I made this and it was really great, but the texture was a little off…it looked a tiny bit separated? Maybe that’s because I used powder instead of flakes. I really want to make it again and achieve the texture shown in the photos. The taste was very good though! P.S. 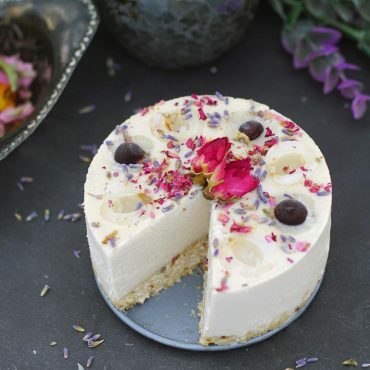 What’s your absolute favorite thing to do with almond flour? I really want to use up my big bag of it! Thanks for the troubleshooting, Audrey! I will probably give it another shot tomorrow. 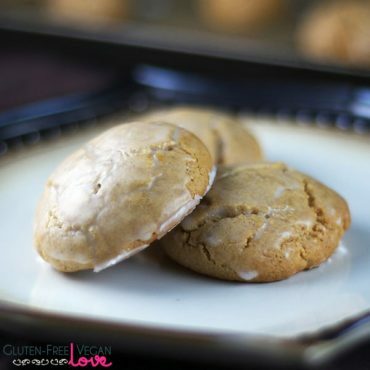 Those cookies look absolutely stunning-I was eyeing them before, and now I really want to make them! Gotta say…custard has been on my mind lately. You must have received the message, too! Good timing then :) Enjoy!